Sodium sulfide is the chemical compound with the formula Na2S and it has an antfluorite structure. 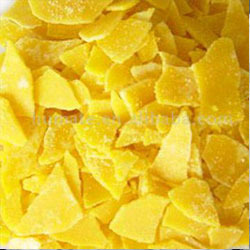 It’s a yellow appearance, water-soluble salts that give strongly alkaline solutions. When exposed to moist air, Na2S emit hydrogen sulfide, which smells like rotten eggs. The solution of Sodium Sulphide obtained from the process is concentrated to 10-12% and is available at different percentages in tanker loads. In Industries Na2S is produced by carbothermic reduction of sodium sulfate often using coal. It is used in the production of rubber chemicals, sulfur dyes and other chemical compounds. It is used in other applications including ore flotation, oil recovery, making dyes, and detergent. We are supplying Sodium Sulphide Flakes iron free to all parts of India. We are currently supplying to some of the leading companies in India and we give assurance to deliver our products to client’s destination within given time period.